CDMA is the second most widely deployed technology in the world with more than 100 million subscribers worldwide and is projected to reach 280 million subscribers by 2006. CDMA 2000 1x was deployed in year 2000 and CDMA 2000 1xEVDO is being deployed this year. CDMA 2000 is the natural migration for CDMA IS-95 networks and some of the TDMA networks. CDMA technology is complex to design due to its inherent adaptive characteristic and the introduction of data requires a complete new way of analysing the network from traffic characteristics to performance requirements. The authors bring a wealth of experience in developing solutions for wireless design at CelPlan Technologies, Inc. since 1992. They followed up the evolution of the wireless technology providing innovative solutions at each step. 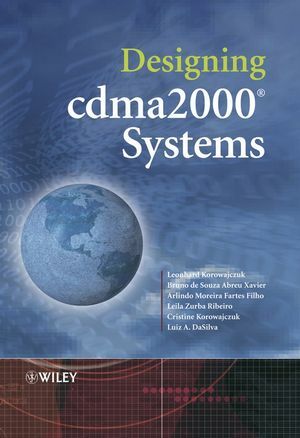 In this book they summarize the description of the CDMA 2000 technology, revisit basic design concepts and propose new solutions to design and optimise these complex networks. Many of the design issues covered in this book apply also to the novel WCDMA networks that are proposed as the evolution of GSM networks. Leonhard Korowajczuk – CelPlan Technologies, Inc. He graduated from the Universidale Federal do Rio de Janeiro in 1969, and has 34 years experience in the telecommunications R&D field. Previous experience include ITT telecommunication engineering departments (Brazil, England, Belgium and Spain). He was one of the founders of the Brazilian Telecommunications Research Center (Telebras-CPqD), Switching department manager and wireless division director at Elebra Telecomunicações/Alcatel, CEO and CTO of CellPlan Technologies, Inc., and also one of its founders in 1992. Was responsible for the design and deployment of wireless networks as early as 1988 and headed the team that developed an advanced MTSO and base station for Comsat-Plexsys from 1993 to 1996. Since then he has led the development of the family of planning and design tools provided by CellPlan Technologies, Inc. Holds several patents in the telecom field and is a member of IEEE. Bruno de Souza Abreu Xavier – CelTec Technologia de Telecomunicações. Ltda. Telecommunications and RF engineers; he graduated as electrical engineer from the Federal University of Minas Gerais (UFMG) in 1996 and did MS from the University of Campinas (UNICAMP), researching on land-satellite CDMA performance analysis. He is responsible for the design of several wireless networks in South America and for training classes on planning, deployment and commissioning of wireless equipment infrastructure. Arlindo Moreita Fartes Filho – CelTec Technologia de Telecomunicações. Ltda. Senior systems engineer; graduated as an electrical engineer from the University of Campinas (UNICAMP) in 1975 and completed MS in 1978. He has several years experience in the telecommunications R&D field, covering system specifications and software, He participated in the design and development of several telecom equipments (hardware and software). He planned and supervised the design of nationwide telecommunication networks, covering transmission, switching and wireless elements. Dr. Leila Zurba Ribeiro – CelPlan Technologies, Inc.
Director of Systems Engineering at CelPlan Technologies, Inc.; she received her Ph.D. in Electrical engineering from Virginia Tech in May 2003. She joined CelPlan Technologies, Inc., in 1993, and her work experience includes the design, traffic dimensioning and optimization of wireless communication systems in several countries. She has also taught graduate courses as an adjunct professor at the Electrical and Computer Engineering Department of George Mason University. She is a member of IEEE. Cristine Korowajczuk – CelPlan Technologies, Inc.
She graduated in 1999 in computer engineering from PUCC (Pontificia Universidade Católica de Campinas), and has more than 10 years experience in the wireless field with CelTec and CelPlan. She has designed and optimized several wireless networks covering all main technologies. She is responsible for customer support, documentation and training at CelPlan Technologies, Inc. He joined Virginia Tech as an assistant professor at the Bradley Department of Electrical and Computer Engineering in 1998, after receiving his Ph.D. in electrical engineering at the University of Kansas. He has previously worked for IBM for six years. His research interests currently focus on performance and resource management in wireless mobile networks and Quality of Service (QoS) issues. He is a member of the Center for Wireless Communications (CWT) and associated faculty at the Mobile and Personal Radio Group (MPRG) at Virginia Tech. He is a senior member of IEEE and a member of ASEE. 1. Introduction to Spread Spectrum Systems. 1.2 The Spread Spectrum Concept. 1.5 Spreading and De-spreading of the DS-CDMA Signal. 2.1 CDMA Standards and Evolution. 2.3 Evolution of CDMA Standards. 4.1 Forward Link Channel Structure in IS-95 CDMA Systems. 4.2 Forward Link Channel Structure in cdma2000 Systems. 5.1 CDMA IS-95 Reverse Link Channel Structure. 5.2 cdma2000 Reverse Link Channel Structures. 6. Call Processing in CDMA Systems. 6.3 Messages Exchanged during Call Establishment. 7. Power Control, Handoff and Radio Resource Management. 7.2 Main Characteristics of Power Control in the System Access State. 7.3 Power Control in Mobile Station Control on the Traffic Channel State. 7.4 Introduction to Handoff Processes. 7.5 Maintenance of Pilot Sets. 7.7 Introduction to Radio Resource Management. 9. Radio Network Engineering Fundamentals. 9.2 CDMA Equipment Block Diagram. Appendix A – Link Load and Noise Rise. Appendix B – Capacity Dependence on User Mix.